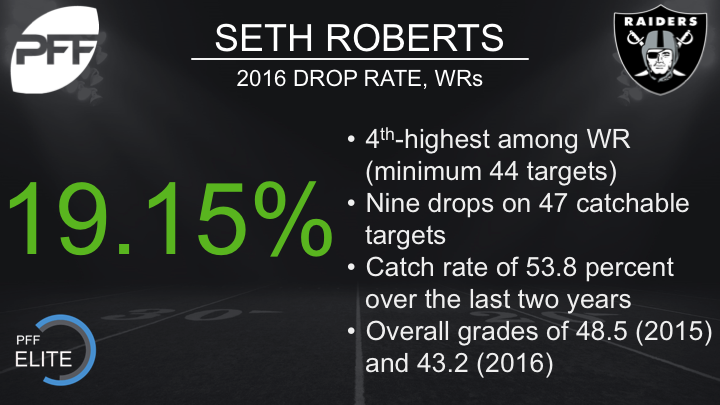 Oakland Raiders wide receiver Seth Roberts played through a double hernia injury all last season but was still able to appear in every game. “It wasn’t my best and I didn’t feel my best but I made it happen,” he said. Roberts struggled catching the ball all season long and had the fourth-highest drop rate percentage (19.15%) of all wide receivers in the league. In his rookie season of 2015, Roberts drop rate was better (15.79%) but still ranked in the bottom-12 of all wide receivers in the statistic for the season. The quarterback rating when targeting Roberts is 91.4 through the first two years of his career but he is well behind teammates Amari Cooper and Michael Crabtree on the depth chart heading into the 2017 season.